This morning GREY2K USA released a report on greyhound injuries at Gulf Greyhound Park, the last remaining dog racing facility in Texas. The overall statistics are tragic. 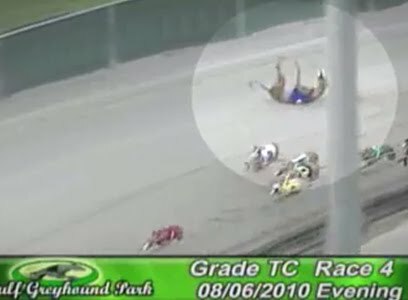 Since 2008, 1,351 greyhound injuries have been reported at the track and 49 greyhounds have died or were euthanized. Our report was covered in a front-page story in the Houston Chronicle. The most relevant facts that emerge from these state injury reports, however, are not statistics. The records also document individual dogs who suffered and died. Even though we cannot help these dogs, we can honor them by telling their stories. Today, I would like to remember Carla and Patches, sister greyhounds who both died at Gulf. These two greyhounds undoubtedly knew each other well, and probably spent much of their early life together. On February 25, 2010, Rags Carla was euthanized after she broke her right front leg during a race at Gulf. Her sister, Rags Patches, died at the track only two months later. According to the injury report for Patches, she died on April 30 after she fell during a race, broke her neck and was paralyzed. Patches was nineteen months old at the time of her death. Of course, these are only two of the dogs who have suffered at Gulf, and all of the dogs who died there deserve to have their stories told. That is why we also released a short video today that documents three fatal greyhound injuries at the track. Please watch this video, and forward it to others. In this small way, we can give these poor dogs a voice. What more can be said? I don't need a sad video to understand the depth of this issue. I just look at my greyhound. Keep lobbying for these dogs.